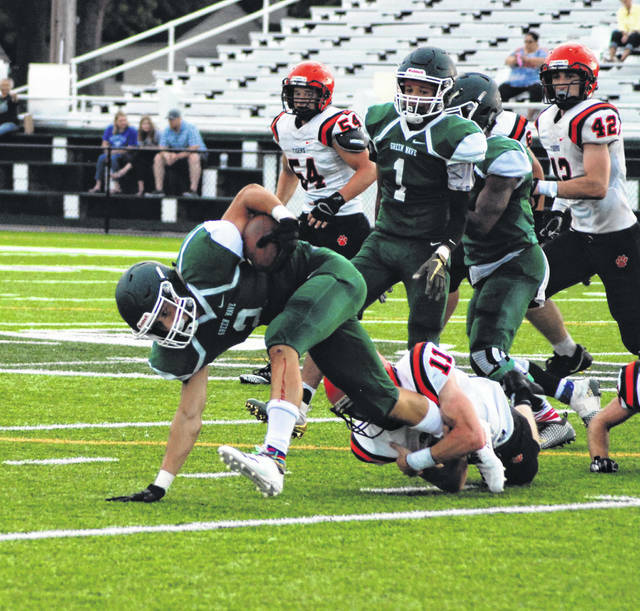 Greenville’s John Butsch (2) tries to get away from Versailles tackler Ryan Martin (11) during the final scrimmage game for both teams on Aug. 17. Greenville’s Dru Quinn (50) tries to bring down Versailles running back Jake Poling (6) from behind during the two teams scrimmage game on Aug. 17. Here we go football fans! It’s time to get the 2018 high school football season underway. Let me tell you how excited I am to be here in Darke County and how anxious I am to see your teams on the gridiron this season. It has been a few years since I have roamed the sidelines on Friday nights and boy have I missed it. To me, there is nothing like being out there on a Friday night taking photos and writing about these games, these teams and these players for all our readers to see. I’ve had the opportunity to watch several of the local teams in either practice or a scrimmage so far and I am excited to see how the season goes for each one of them. I’m sure not all of them will have the kind of season they hope for, but I am going to give my best effort to see each and every team play at least once. I can’t wait to be out there, and feel free if you see me roaming the sidelines to give me a shout. I’ll be happy to meet you. With all that said, I will be at the Greenville-Eaton game to kick off the season. From talking with Coach Aaron Shaffer several times and watching the team perform in the preseason, this could be a special year for the Green Wave. I’m ready, and I know you are ready too, to see how it turns out. Each week throughout the season, we will run football capsules for each and every game in our coverage area. We also will have our 2018 High School Football Pick’ Em chart so you can compare how our panel of experts do each week and throughout the season. Outlook: Greenville is loaded with weapons on offense with Tyler Beyke under center throwing to receivers such as Colton Zumbrun. The GHS running game is pretty heavy too with Landon Eldridge leading the rush. The Eagles may have a tough time containing the Wave. Outlook: Ansonia was the only playoff team from Darke County last year, and though they lost a few starters from that squad, the Tigers should be in contention for the postseason again this year. It was a close one with Riverside in 2017, and will likely come down to that again. Outlook: Greeneview bullied its way through the season last year with a perfect 10-0 mark. The Rams have been to the playoffs for three consecutive seasons now and show no signs of letting that get away from them. 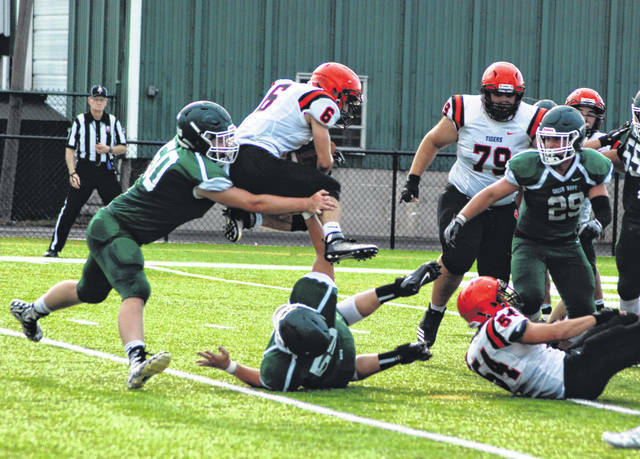 Arcanum didn’t fare well against Greeneview last year, but the Trojans looked good in the preseason and could rise up and surprise the visiting Rams this time. 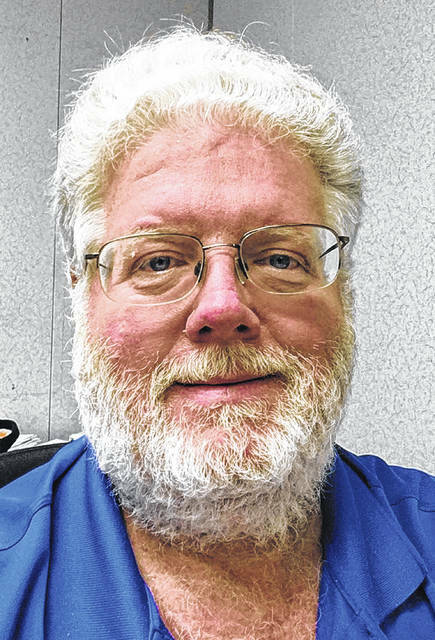 Outlook: Kudos to the Railroaders for not giving up on this season. While it will be extremely challenging for the 13 players to obtain wins this year, success is not measured by wins and losses alone. They all need to remember that especially as the season gets deeper into September and October. Outlook: Mississinawa Valley got its first win in nearly three years last season and new coach Steve Trobridge wants to build on that momentum. Trobridge has been an assistant coach with the Blackhawks for the last few years so he knows what it is going to take to get his team to take the next step. Outlook: Just last week, Coach Robert Burk said his Patriots were “ahead of where we were at this point last season.” Burk said that after a home scrimmage with Troy Christian where his offense had flashes of success and his defense put up quite the resistance against the Eagles. He’s hopeful that the fourth-year program can keep showing signs of improvement. Outlook: Versailles is just like every other team with wanting to get off to a good start. A win at Celina would be a great way to do that as the Tigers will be at home for the following two weeks including their MAC opener with Coldwater in Week 3. This entry was tagged Ansonia Tigers, Arcanum Trojans, Bradford Railroaders, CCC, Greenville Green Wave, GWOC, MAC, Mississinawa Valley Blackhawks, Ohio high school football, OHSAA, SWDAB, Tri-Village Patriots, Versailles Tigers. Bookmark the permalink.